What Happened to This Nike Air Huarache? A sample of a new hybrid from Nike Sportswear. Nike Sportswear's latest hybrid takes a lot of liberties with the classic Nike Huarache DNA. The sneaker, shown here in sample form, is a cross between two Tinker Hatfield models: the Nike Air Huarache and the Nike Air Max 90. The bottom is all Air Max, complete with the visible bubble on the back end. The upper is more of a mixture though, as the Huarache's inner bootie is stamped with back badge of the Air Max 90. On the materials side the shoe is nothing like traditional versions of either what with the hemp/iridescent combination. 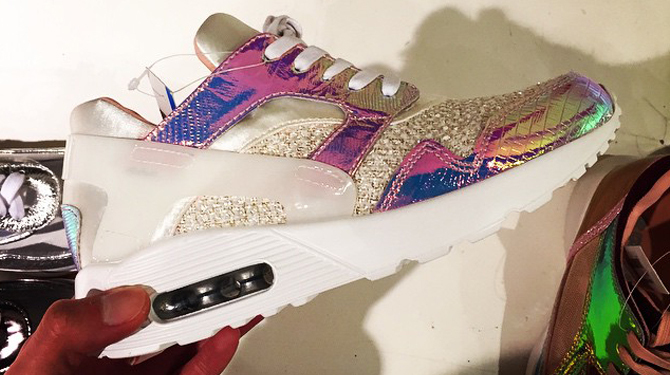 There is no release info yet for this strange Nike Air Huarache x Nike Air Max 90 creation.